Background: The Griffin's may not be a brand that a lot of cigar smokers are acquainted with, but they should be. 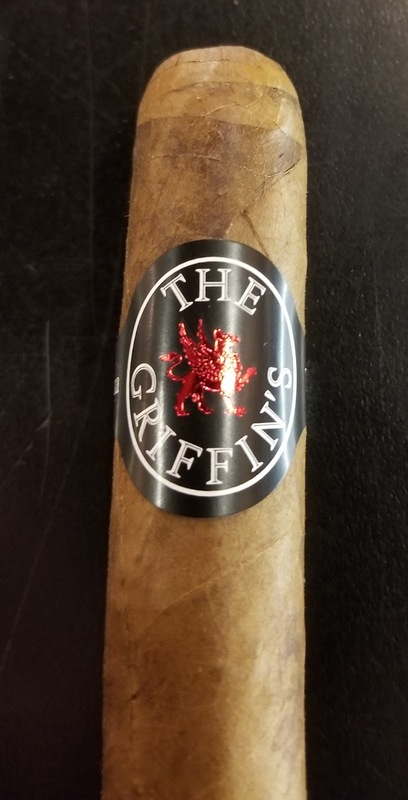 If you didn't already know, the Griffin's cigars are more or less a more affordable version of Davidoff cigars - considering that is exactly who makes them. Typically seen as a premium blend in the more mild and creamy realm of things, Davidoff has been (in the past couple of years) taking steps into having some more full body smokes in their arsenal. Logically a Griffin's version would follow - and this is set to be it. 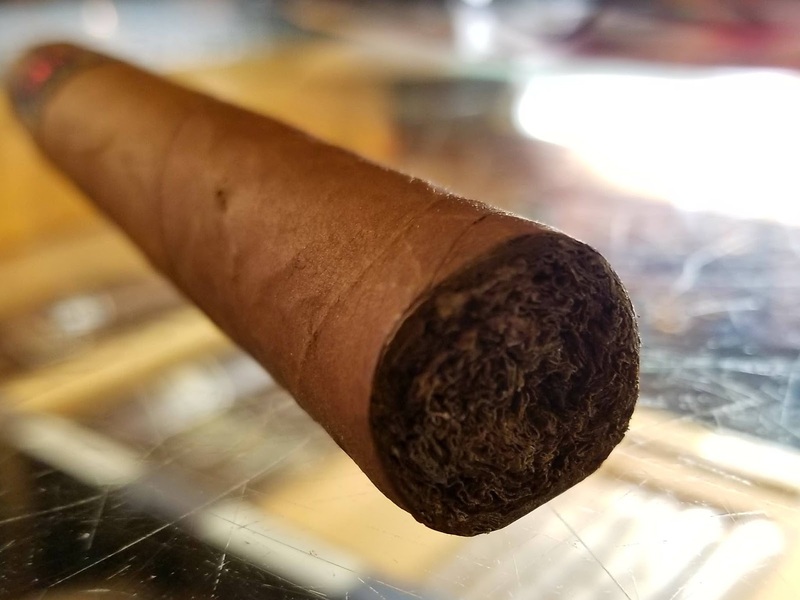 Appearance (0-20): The Nicaraguan habano wrapper on this stick is light in tone, which actually hurts the rating a little because it shows a lot of smaller imperfections and nicks that may have been hidden otherwise. On the foot you can see a nice swirl of different tobaccos, giving some very distinct lines for the Dominican piloto cubano binder, Dominican San Vicente seco, Dominican piloto mejorado seco, Honduran Olancho seco, and Nicaraguan Estelí ligero and Ometepe viso. The wrap job is also a little wonky toward the top, along the band. Inverted colors on the band do stand out pretty well. Instead of the standard white backdrop to the band with black writing and a gold embossed griffin, this one sports a black backdrop with white writing and a red embossed griffin. Kudos on the color selection there. Construction (0-20): I can't be mad at how this one is constructed. The first feel of the stick is the soft and silky wrapper. After giving some pressure throughout, it is evident that the cigar has evenly distributed and there shouldn't be any issues there. The initial cut was completely clean and the prelight draw was spot on. 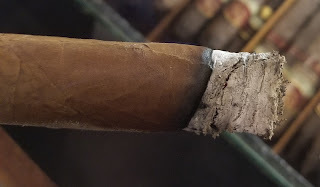 As I smoked through the stick, it remained nearly perfect on the draw and there were only small variations in the burnline. Strength (0-20): The strength is listed at a full, and in that respect it absolutely lives up to its name. Between the pepper and the nicotine kick, it peaks into full with just the right punch. Flavor (0-20): Right off the bat I am a little thrown off. There is a really grassy flavor on the tongue when drawing in that mixes with the flavors and leaves an almost bitter aftertaste. I can still discern some minor cocoa notes but the predominant flavor is pepper, especially on the retrohale. This continues through the majority of the smoke, with a few minor touches of sweetness, but overall its straightforward and consistent - pepper with a bit of an odd grass / floral / veggie kind of taste. Value (0-20): I wont even beat around the bush on this one. I am not fond of the $12.50 price associated with this cigar, but it is still $6.00 less than you would pay for the Davidoff version of nearly the same smoke. 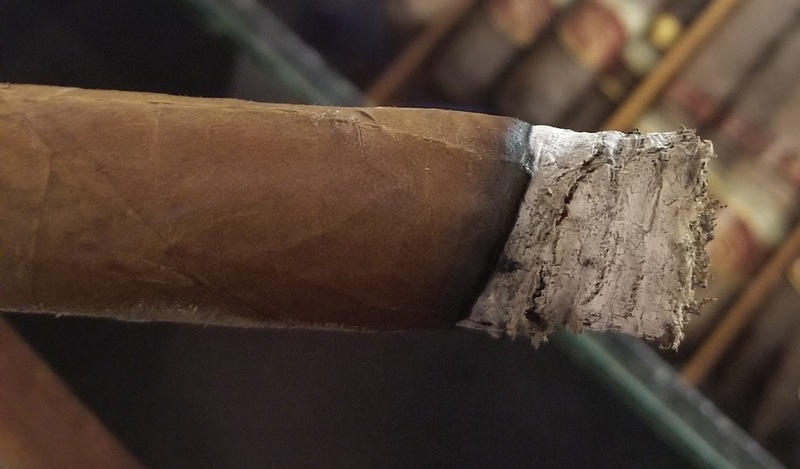 Overall (0-100): There is so much I am torn about with this cigar. On one hand, its got the strength (full) and spice (straightforward pepper with slight spice and bitterness) that I really enjoy in spades. The construction is on the money and overall it stays very consistent throughout. However, I am not wild about the appearance of the wrapper (even though the band is pretty cool)... and I am much much less wild about both the grassy flavor associated with the experience. Factoring those things together and I really do not see this as the type of cigar that I want to put over $10 into. Is it a bargain based on the fact that Davidoff cigars run close to $20 each? Meh. Maybe. But are there better cigars for a cheaper cost? Absolutely. I may be in the minority on this one in the long run, but I didn't love it. While I wont turn down giving this one a second chance in a few months, I also wouldn't run out and buy one immediately. I mean hey, maybe the time resting will help the flavor a bit.. but only time will tell that. The wrapper is a rich chocolate shading with negligible veins and a clean, relatively e-liquid distributor vague wrap line. The blend of tobaccos on the foot flaunt what this is pressing.